North West Hospice provide palliative care with compassion for those living with life-limiting illness in our communities in Sligo, Leitrim, South Donegal and West Cavan. 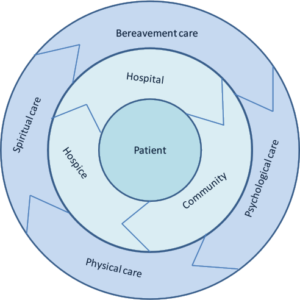 Palliative Care is the approach that aims to improve the quality of life of patients and their families facing the challenges associated with cancer or other life-limiting illnesses. Our interdisciplinary team approach ensures that each person receives the best support and continuity of care whether they are at home, in a community healthcare setting, in Sligo University Hospital or in our hospice. We work closely with occupational therapists, physiotherapists, pharmacists, General Practitioners (GPs), Public Health Nurses (PHNs), speech therapists, dieticians, home and personal support services, night nurses and other healthcare professionals to create the best care plan for each person.